Ken Clarke's plans to reform civil legal aid I fear, will leave hundreds of thousands of vulnerable people facing debt, homelessness and miscarriages of justice with no access to legal recourse. Thatcher made some cuts to legal aid but this goes way way beyond that - Clarke aim's to reduce the number of legal aid cases by half a million a year - moving entire legal areas out of the reach of many people. Areas proposed include debt advice, social welfare, employment, personal injury, clinical negligence and areas of housing. Last week I was helping a friend who was in considerable difficulties and one of the only routes might be legal aid - for that not to be there really is shocking. The Tories claim the move will put an end to litigation culture. What utter nonsense. It is those fighting evictions, unfair dismisal, non-payment of wages and police victimisation who will find themselves without the help. There also lots about 'fatcat lawyers' but in reality legal aid lawyers are a different breed altogether with average wage for a legal aid brief being about £25,000. It is no wonder Labour wont stand up for the rights of the poor as Tories and Lib Dems have cleverly reframed the debate around fatcat lawyers. I saw George Monbiot writing in The Guardian said: "The rich will reap none of the pain and all of the gain of Kenneth Clarke's legal aid cuts." Monbiot gives examples of how the cuts will impact - as he says: "Those who are no longer entitled to legal aid will find themselves fighting, single-handed, against landlords, insurance companies and the state. Either they will clog up the courts, as cases with litigants in person generally take much longer than cases with legal representation, or they will give up and take the knock. That's what the Tory war against elites looks like. The rich reap none of the pain and all of the gain." See the Facebook campaign 'Say no to legal aid cuts in the South West'. There is apparently a demo outside the South-West offices of the Legal Services Commission: Queens Square, Bristol on 7th February from 12 noon. Wow, that questionnaire is horrible. If anyone manages to find the time too lokk through all the documents and can provide a quide explaining the questions that would be great. 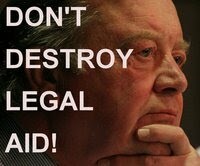 What an awful situation - cutting legal aid for matters concerning debt!!! how does that possibly make any sense!! !